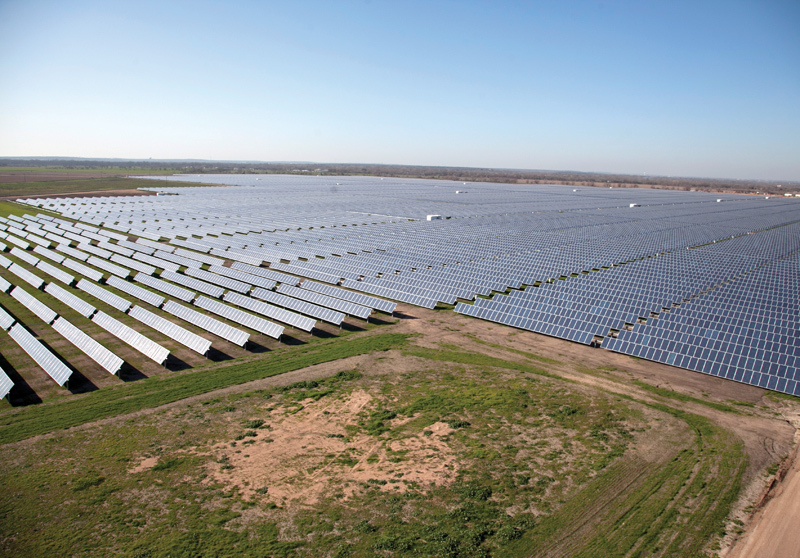 Texas is known for thinking big, and the Webberville solar project near Austin is no exception—at 30 MW, it is the largest solar project in the entire state. The City of Austin, Texas, has been a trail-blazer when it comes to alternative energy in recent years. The city is home to Austin Energy, the ninth largest community-owned electric utility in the U.S., which serves more than 400,000 customers and a population of almost one million. Austin Energy has developed one of the leading renewable energy programs in the U.S. It owns the country's first and largest green building program, and the city is home to one of the nation's most comprehensive residential and commercial energy efficiency programs. Austin City Council recently set up a Solar Committee to review further ways the city can pursue solar power, whether it is through encouraging residential installation or large scale solar projects. The Austin Energy Resource &Climate Protection Plan approved by the Austin City Council in 2010 set a target of achieving 35 percent renewable resources by 2020. This includes 200 megawatts of solar capacity and 1,000 megawatts of wind power. During fiscal year 2011, about 10 percent of the power delivered from Austin Energy to its customers came from renewable resources. Austin Energy will be purchasing all power generated from a 100-megawatt biomass plant scheduled to go online in June 2012. In September 2011, the Austin City Council approved two new 25-year wind contracts, which will bring Austin Energy's total wind output to more than 700 megawatts by 2013. 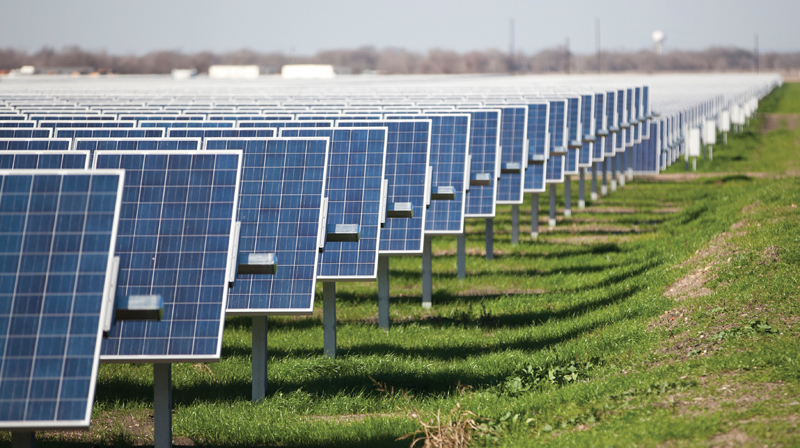 This will bring Austin Energy's renewable energy portfolio to around 25 percent. in Texas. Under a Power Purchase Agreement, Austin Energy has agreed to purchase the electricity generated by the project for 25 years. The Webberville project, which is 15 miles east of the city on land owned by Austin Energy, was developed and financed by FotowatioRenewable Ventures, a division of Spanish renewable energy companyFotowatio SL. It was owned by SunEdison, which sold it to MetLife and Longsol Holdings in late 2011. Longsol Holdings is a private owner and operator of solar projects in the U.S. and Europe. RES Americas built the Webberville solar facility and will provide maintenance services for five years. Anna Giovinetto, vice-president of corporate affairs for Colorado-based RES Americas, said its expertise in development, engineering, and construction allows it to offer solar clients the same suite of innovative solutions, in-house engineering, and construction performance capabilities that it delivers to the wind industry. "I think there were good reasons why we were selected as the Balance of Systems contractor for Webberville," said Giovinetto. "I think our extensive experience and great track record in wind power indicated to the client that we had the in-house capabilities to successfully meet or exceed their expectations on the Webberville solar project." Austin Energy issued a request for proposals in 2008 for the Webberville project. RES Americas became involved in the fall of 2010, with limited notice to proceed in December 2010. Engineering, procurement, and logistics planning began immediately—RES Americas moved quickly to take the work that was done in the development stage, optimize the design, and turn it into a construction-ready package to meet the contract schedule. The project began construction in spring 2011 and was completed this past February. 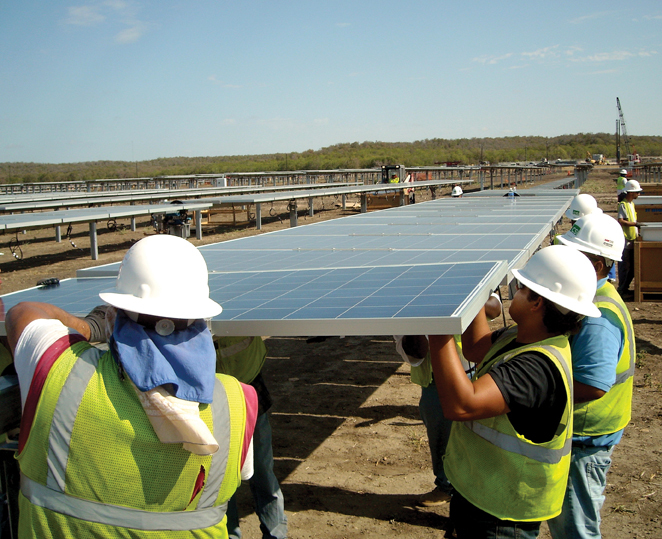 RES Americas became involved with the Webberville solar project in the fall of 2010 and moved quickly to take the work that was done in the development stage, optimize the design, and turn it into a construction-ready package to meet the contract schedule. The project began construction in spring 2011 and was completed this past February. "I think the key takeaway is that there is a lot of transferability in the skillset needed to deliver success on major wind projects and the skillset needed to deliver success on major solar projects," said Giovinetto. expertise; close coordination between field staff and engineering; rigorous internal procedures for safety, environmental, quality control; and a proven history of success, including close relationships with utilities, power authorities, local government, and landowners. "Among the strengths we have are these terrific in-house engineering and construction teams, folks who are experts in their field," said Giovinetto. "They have been working together for a long time, and they work in close coordination. This is advantageous for our clients because it enables seamless communications between those teams, and things happen a lot faster. It's a more efficient process, and it makes projects more cost-effective, whether they're big wind farms or big solar facilities." Big is the perfect description of the Webberville solar project. The solar field covers approximately 220 acres, and the project has 127,728 Trina Solar modules. Eighteen large module sections are connected together in a series and are wired to 448 combiner boxes that are distributed throughout the site. 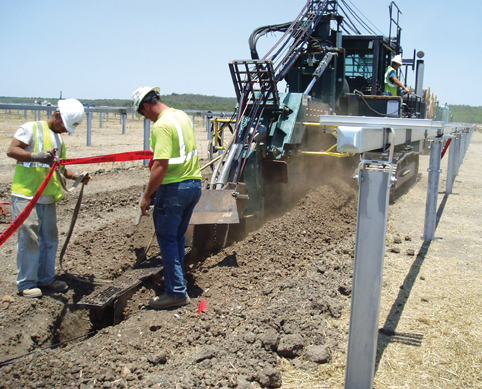 A total of 26,400 driven piles were installed to support the 2,400 rows of single axis trackers. There are 112 tracker motors that move the modules to follow the sun from east to west. Nineteen centralized inverter houses/step-up transformers convert the 35 MW of DC power to 30 MW of AC power. Linking the project to the grid required significant upfront coordination with the Electric Reliability Council of Texas (ERCOT) and Austin Energy, considering this is the first project of its size in Texas. Each year, the plant is expected to produce approximately 63,000 megawatt hours, which is enough energy to power 5,000 average homes. The solar module layout was based on pre-installation engineering analysis and proved effective to meet performance requirements, says RES Americas. Some adjustments for site-specific elevation considerations due to flood-plain were required. The project uses a combination of Trina Solar 270, 275, and 280 watt poly crystalline solar modules. The modules are mounted to Array Technologies Duratrack HZ horizontal single axis trackers with central motors and drivelines connecting up to 22 rows (1,188 modules). Big is the perfect description of the Webberville solar project. The solar field covers approximately 220 acres, and the project has 127,728 Trina Solar modules. A total of 26,400 driven piles were installed to support the 2,400 rows of single axis trackers. The tracker foundations are galvanized steel wide flange beams that are driven approximately 12.5 feet into the ground. The top of the tracker foundation has slots cut into it to bolt on the tracker bearings and drive gears. Under an agreement with Wind Turbine & Energy Cables Corp. (WTEC), who was the electrical subcontractor, Emerson Electric provided the utility-scale power inverters, which are controlled through a state-of-the-art inverter management system. The power is fed into 18 Emerson 1.6 MW inverters and one Emerson 1.2 MW inverter. The inverters output AC power at 385 volts that is then stepped up to 34,500 volts at the inverter house through an ERMCO pad mounted transformer. The 34,500 volt collection system is broken up into two main circuits that collect the power from the inverters and run it to a project substation. The two circuits are cables that are buried under ground. The project substation steps up the voltage from 34,500 volts to 138,000 volts using an ABB main transformer. Austin Energy takes the power from that point and has constructed new overhead lines to run the power to a nearby Austin Energy substation. RES Americas supplied the trackers for this project along with everything else except the modules, which were supplied by the client. The soil varied throughout the site. More expansive clay soil was located in the northern part of the project requiring the tracker foundations to use slightly longer piles (foundations) embedded into the ground. The clay soils can expand and contract as the moisture content of the soil changes. This can cause the foundation to work itself out of the soil. To determine the appropriate depth for the piles, RES Americas conducted extensive pile pull-out and lateral load deflection testing on a dozen sample test piles that were installed at various locations on the project site. RES Americas engineers used the test results to finalize and optimize the final foundation design. The proximity to major highways and rail facilities helped in transporting materials to the Webberville site, the company says. More than 750 heavy trucks made deliveries to the site from all parts of the U.S. Logistics planning is more critical for solar PV projects compared to wind projects, due to the increased hardware quantities, the cascade effect on schedule, compactness of the site, and PV module delivery from overseas, says Giovinetto. She adds that, at times, the project was all about logistics. "You think about a large wind project, and at 200 MW, you might be looking at 100 turbines. That is significant, but you go to a large solar project like Webberville, and you're talking about almost 128,000 solar panels." "That's a lot of material that has to be brought on to the site and distributed and assembled. It requires tight coordination, excellent communication, and high level project management skills." The main challenge, she says, was dealing with and organizing the approach to handle the volume of components. An example is the scheduling, tracking, and sequencing of deliveries. For example, one shipment of 66 Sea-Land containers totaling 29,000 PV modules was received at the site over a nine-day period. Up to 75 electricians/apprentices were used at the peak of construction. Inspectors had to walk up to three miles a day to complete their rounds. Then there was the weather. The project experienced record heat in the summer (more than 90 days of 100+ degree temperatures) followed by a wet, cloudy winter (twice the normal rainfall, lack of sun) during commissioning. The Webberville project used a combination of Trina Solar 270, 275, and 280 watt polycrystalline solar modules. The modules are mounted to Array Technologies Duratrack HZ horizontal single axis trackers with central motors and drivelines connecting up to 22 rows (1,188 modules). There was a large volume of electrical components and connections requiring testing/commissioning. To keep things moving forward on the ground, RES Americas practiced cross-functional teaming of seasoned engineering, construction, and procurement personnel who applied best practices. Staff used a disciplined approach to manage field construction techniques and quality control/assurance by using upfront reviews of critical characteristics and consistent follow-up. Additionally, there is a daily team review of project schedule and milestones. Big projects are, as Giovinetto put it, in the company's DNA. Its parent company, Renewable Energy Systems Ltd, was originally formed as part of the Sir Robert McAlpine group, a British family-owned firm with over 145 years of experience in the construction and engineering sector, and which recently completed construction of the 80,000-seat Olympic Stadium for the London 2012 Olympics. UK-based Renewable Energy Systems Ltd. has been an established presence in the wind energy industry for over two decades, developing, designing, building, and operating wind farm projects worldwide. It has a portfolio of more than six GW constructed and several thousand megawatts under construction and in development. In particular, Giovinetto says there were several keys to the Webberville project being successful, among them coordination and communication. "Because our engineering and construction teams are in-house, with their offices right next to each other, they are used to coordinating with each other. It's not a situation where you have two different firms that are passing things back and forth. "We also emphasize communications, both within our company, and with our clients and external stakeholders, which in the case of Webberville included the City of Austin, ERCOT, and Travis County. We really see transparency and communication as being critical to a project's success." The project owner had precoordinated most permits. But regular meetings were held with local authorities at pre-construction and during construction to provide regular progress updates and ensure compliance with local regulations including environmental, fire, building, and highway. The aggressive construction schedule (nine months to fully construct the 30 MW project) required daily monitoring of progress of material deliveries and installation. For example, the daily number of piles driven and daily number of modules installed was monitored closely. Day and night shifts were used at critical points to maintain production. With construction of the Webberville project now complete, Giovinetto says RES Americas expects to remain active in solar construction. "We see solar as an exciting growth market both in the U.S. and Canada, and part of our strength as a company is derived from our ability to diversify and pursue other markets, both in terms of different technologies as well as geographically."